It dissolves karmic density, as you follow your evolutionary journey through the 5GATEWAYS, into the New Paradigm. What exactly does this mean, how can it help you and how might you apply it to every day life? Openhand helps people apply the "Openway" process to your life in our 5GATEWAYS work. Check out our course section for full info. As you finely attune your spiritual compass, the confusion of the moments conflicting impulses dissolves. You are more readily able to drop into the Void of Infinite Potential - the place of pure presence where all authentic action is born. You find it more easy to resist making pre-programmed and limited choices that disempower. Instead, you unleash expressions of profound, authentic beingness. This shapes your world in a divinely mystical and miraculous way. Such Right Action leads you on a progressive evolutionary 'Ascension' through the 5GATEWAYS of expanded consciousness. It is an inner journey which infuses these profound gifts of beingness - your soul - into your life and through your world. 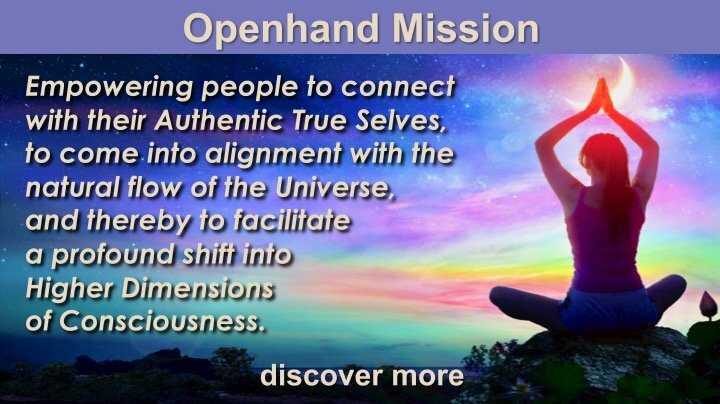 Learn how to apply "Openway"
To fully understand what each step of "Openway" truly means and how to integrate them into one seamless process for soul-led decision making in day-to-day life, Openhand provides a specific five day retreat called "5GATEWAYS".